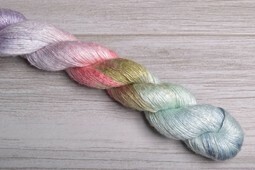 Spun with 100% pure silk, Artyarns Silk Essence is a true luxury yarn. Soft & drapey with an amazing sheen, it is perfect knit alone or held alongside another fiber. Ideal for heavenly shawls.